Skateboarding has been popular for decades, all across the country—and Michigan is no exception. With the ever-changing landscape and advancing of the sport, a good place to find high-quality equipment is essential. The skate shop is a vital part of skateboarding operations, and in Michigan, there are plenty of spots offering first-rate gear. Here are the 10 best in the state. Royal Oak's Modern Skate and Surf represents a complete skateboarding experience. Offering not only skateboard decks, wheels and trucks, but also complete skateboard and complete longboard options, skaters have plenty to choose from here. Throw in complete lines of apparel and accessories along with gear for snowboard and roller derby and Modern Skate and Surf will supply at every level. Launch Board Shop in Ann Arbor got its start with the new millennium--it started in 2001, so literally the new millennium--and has been delivering both quality goods and expertise to its shoppers for years. Featuring everything a skateboarder could need from parts to skateboards to even apparel, Launch Board Shop offers a complete range of options for its visitors. Head to Eastpointe to check out Pigeon Skate Shop, and get access to some impressive options. Voted the No. 1 sporting goods store in the Detroit area—which encompasses a lot of littler locations beyond Detroit proper—in a 2012 poll, it's the longest-running skate shop in the area owned and operated by skaters. That means over 30 years' worth of knowledge on hand, and the combination of expertise and material on hand makes Pigeon a great stop. Mount Clemens is home to TGM Skateboards, a skate shop that offers a wide array of skateboarding materials. From skateboards and longboards to hardware and accessories, the menu is fairly complete. Plus, TGM Skateboards has a particularly noteworthy web presence that can't be ignored. The site will not only offer free shipping for all orders, but will even offer an Amazon-style wish list that makes gift buying for the skater in your life that much easier. Out in East Lansing, Action Board Shop provides not only the area's college student population with some impressive varieties in skating gear, but most anyone else who comes by as well. Featuring complete boards as well as the various components to modify same—trucks, decks, wheels and bearings—as well as associated gear and the ability to ship anywhere in the United States for free, Action Board Shop likely has the answer to your skateboarding question. In Rochester, there's a skate shop with a life all its own. The South Street Skateshop—also home to the Cockeyed Sock Company—offers skaters a dizzying variety of options. Naturally, there's all the basic components here, as well as completed units, but there are also clothes, hats and bags for skaters to enjoy. It's not a list, it seems, until Traverse City makes an appearance. 2nd Level Goods will produce an impressive package of goods for skaters to consider. Featuring both longboards and cruisers alongside normal skateboards, as well as a selection of decks, wheels and trucks, 2nd Level Goods will include clothing for men and women, as well as a line of snowboarding gear as well. Wind Waves and Wheels in Kentwood covers skateboarding in all its forms, branching out beyond that to windsurfers, surfboards, and even snowboards. The place has a long history dating back to 1984, and though it's seen good times and bad, it's survived all these years to offer up an exciting array of board sports tools and related accompaniment to those who crave the chance to go fast on a variety of media. By virtue of being the only skate shop in Saginaw, Pops Skateshop wins a place in the roster. Leaving aside its sheer uniqueness, Pops Skateshop won't disappoint in terms of what's available. It's got most of the standards in skate gear, and will ship those anywhere in the United States for free, but it actually takes things one step farther. Those who want to learn how to skate can get lessons here, a development which is unusual in most every regard. Battle Creek's Go Skate shop exists to fill a need in the area: A place to pick up skateboarding materials. It can ship these materials anywhere in the state for free, if the order's over $100, but it also offers something few others do, specifically, an opportunity to learn how to skate with a set of lessons. 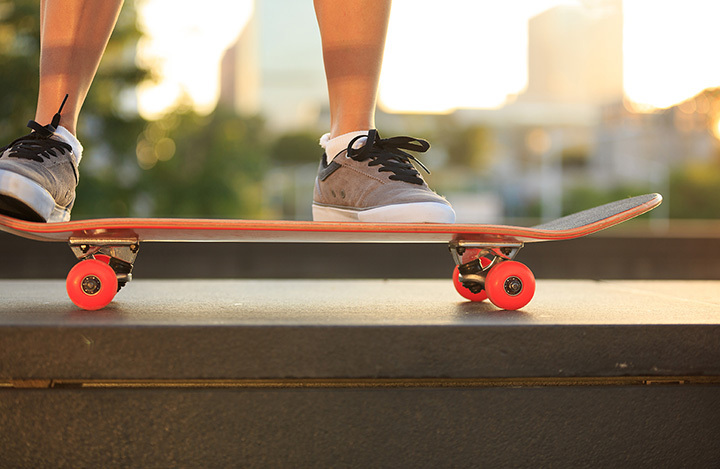 Go Skate offers an online learning program—a discount is available with purchase—as well as skate lessons in real time.